Sunflower utilises soil nutrients to the maximum. This is because it has a highly developed root system that can “reach” nutrients more effectively than other crops. It is essential that any fertilisation programme for sunflower be based on a soil analysis. By studying the soil carefully, you’ll be able to decide on the amount of fertiliser to use and so avoid expensive wastage. If there’s a shortage of nitrogen, growth rate decreases dramatically, leaves turn pale green and the lower ones die off. If there’s a shortage of phosphorus, growth will be poor and the tips of the leaves may even die. The solution is to build up the phosphorus content of the soil over time. 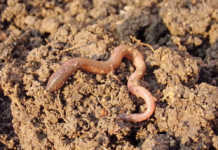 Because each farmer’s soil is unique, however, you’ll need to speak to your seed company or extension officer for expert advice on your particular soil. Shortages of boron and molybdenum cause stunted plants and limit the growth and yield of sunflower in the eastern parts of the country. To avoid problems, apply fertiliser containing boron and ensure that seeds are treated with molybdenum by the seed company. If you haven’t analysed your soil, apply 50-100kg/ha of a 3:2:1 (25) fertiliser mixture at planting to obtain a yield potential of 1 000 to 1 500kg/ha. Getting rid of weeds is essential for high yields, as weeds compete with young sunflower plants. Keep your crop free of weeds for the first six weeks after planting. • To avoid damaging plants, hoe before the sunflower has grown tall. • Don’t hoe deeper than 75mm to prevent harm to the roots. 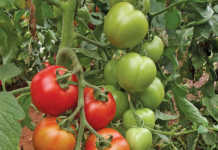 • Throw soil onto the row to suppress weeds. • Hoe when the soil is dry to kill off smaller weeds. • Hoe during the hottest part of day when the sunflower is wilted. This reduces stem breakage. Another way to remove weeds is by using weed killers. These are helpful during wet periods when it may be impossible to remove weeds by hand. Growing sunflower in rotation with maize or sorghum allows you to control weeds more effectively in both crops as grass and broadleaf herbicides can be used in succession. 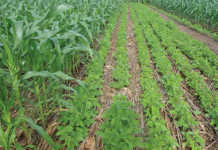 Pests also decrease with crop rotation and there is often an increase in yield and quality in a follow-up maize or sorghum crop. Start when 80% of the sunflower heads are brown to reduce losses caused by birds, lodging (plants falling over) or shattering (seed heads disintegrating). Source: Sunflower Production, by HL Loubser, compiled by the Directorate Agricultural Information Services, Department of Agriculture, in co-operation with ARC-Grain Crops Institute. For more information on specific cultivars, phone the ARC-Grain Crops Institute on 018 299 6100.